Battles over finding money to pay the construction of a U.S./Mexico border wall, the Obamacare subsidies and more resources for U.S. military threaten to be problematic for congressional negotiations over the funding bill that would stave off a shutdown of the government on Friday. Bipartisan negotiators are weeks into working methodically through different issues to set up spending across all federal agencies for the remainder of the fiscal year, with officials in the White House for the most part off to the side being briefed on a number of the issues. However, Democrats have warned that the Trump administration, which remained out of the fight during most of the talks, is increasing its demands, insisting on the inclusion of money to build the border wall in exchange for the continuance of paying insurance company subsidies to boost the marketplace for Obamacare. President Donald Trump highlighted the issue during the weekend. The Democrats do not want the money from the government’s budget to build the border wall even though it would help to stop drugs and gang members, tweeted Trump on Sunday. However, officials in the White House said on Sunday that they did not want a shutdown of the government due to an impasse in talks over spending and that was a directive that came from the President. Top officials in the White House explained to Trump over the weekend that the scenario that was most likely to take place would be a stopgap bill which would last one week or until a deal had been reached. Aides for top Democrats and Republicans on the different appropriations committees said they were making some progress under pressure of the looming deadline. 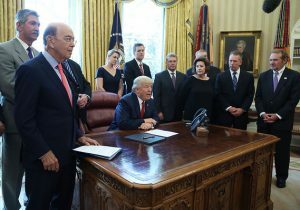 However, they conceded that significant points remained that were problematic and Congress, which return this week from its recess of two weeks, would have only a couple of days to get the measure to the President for his signature. A number of congressional aides have said that Congress might need a stopgap measure that potentially would last just a week to give them sufficient time to work out a final deal. Details of a deal are not readily available. Republicans in the House said their leadership had not given many specifics during a Saturday private call with GOP members due in part for fear that someone would leak the call.